Spacecraft Viking-1 USA photographed an astounding formation on the surface of Mars. The 1.5 kilometer-long object bore resemblance to woman’s face. The photograph produced a sensation in the whole world – almost all newspapers and magazines of the world published the picture on their pages, the image of the Martian face was on constant presence on television. Astronomers said the image of the face on the red planet was a wholly incidental trick of nature. The face, however, was oriented on the Martian meridian, but it was considered incidental too. Specialists from the Boston-based Analytic Sciences created a 3-D image of the above-mentioned structure and discovered the image of the ‘humanoid face’ on it indeed. Having intensified the contrast of the shaded right side of the image, specialists found the second ‘eye’ situated about 100 meters beneath the ‘nose.’ To crown it all, there was something reminiscent of ‘teeth’ too. According to the results of the analysis, specialists concluded the anomalous formation could not be of the terrestrial origin. Furthermore, engineers Vincent DiPietro and Gregory Malenaar found another image of the face in the archives of Martian photographs. 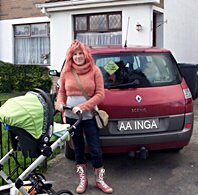 The picture was taken with different lighting 35 days after the first original image was taken. The detailed computer analysis proved the peculiarities of the first picture and revealed new details as well. One could see an ‘eyeball,’ a ‘pupil’ and ‘teeth’ on the sun-lit ‘cheek.’ The two engineers concluded that if the details of the stone head were of the natural origin, the nature would have to be a reasonable creature. 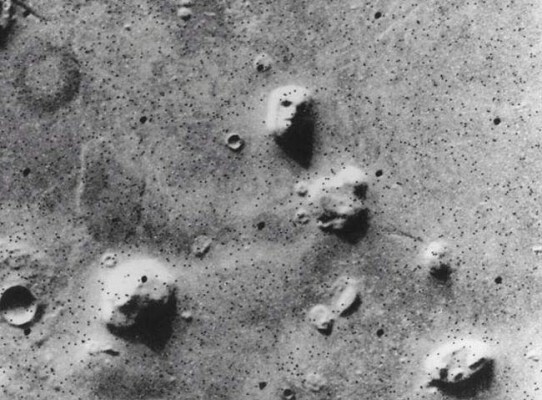 On June 25, 1995 the NASA administration included the test photoshoot of the Martian face in the program flight of Mars Global Surveyor spacecraft. The mission control received the long-awaited photos on April 5th, 1998. The spacecraft took pictures of the face from the height of 440 kilometers (in 1976 the images were taken from the height of 1,870 kilometers). To everyone’s great disappointment, the photos depicted only uneven landscape – one could not see any facial outlines on them at all. One might think NASA officials fabricated the shots – it could be the simplest explanation for the whole matter. However, the history of Martian studies is filled with mysterious aspects. One may recollect Martian ‘channels,’ for instance. Scientists have been observing Martian channels for many years. It was documented that hardly visible channels split into two or turned to wide stripes. Astronomer Giovanni Sciaparelli, the discoverer of channels on Mars, mentioned the Erinnis channel in his reports. The channel vanished from Martian maps for a long period of time, although it appeared on them again in 1941. Scientists have not found an explanation to periodic changes of color on certain areas of Mars, sudden dust storms, a series of inexplicable accidents that happened to Martian rovers on their way to the planet, and mysterious flashes of light (about 400 flashes were observed in 1894 when Mars neared Earth). On December 8th 1951, Japanese astronomer Tsuneo Saheki saw a bright spot near the Martian lake of Titonus. The spot was glimmering for five minutes. Japanese scientists observed two of such flashes in 1954, four of them were registered in 1958. It is not ruled out that the Martian natural disasters ruined the image of the face on the planet. Previous Previous post: Eurovision in Moscow. Next Next post: Europe celebrates Victory over Nazism.